Progress is not inevitable. That is a hard thing to accept, but it is crucial. We have to be willing to do the work. We have to be willing to invest ourselves in making the world better. We have to be willing to risk for our Beloved Community or it cannot come into being. Like with elections, belief in the idea, the goal, or the candidate is not good enough; we have to participate. Silence always empowers the privileged against the marginalized. We wrote last week about how an election is the end of a cycle in the Democratic Process, and that after an election, we start over with the debating, compromising, and maneuvering to get our ideas heard and tested. This is already happening in American politics. The next cycle is getting underway. How can you influence it? Right now, we need to discern what the beloved community will look like and what it means to be a Unitarian Universalist in the world today, working towards that ideal. We need to be willing to state what we stand for and what we will not . We need to be willing to draw some lines, because the point of having the word “responsible” alongside the word “free” is that not every search for meaning is being done in a responsible way. We need to know where those limits are and how we address them.While many of us are not emotionally ready for the next steps, and many of us need a lot more information and time to think through it, we do need to begin thinking about the future we are trying to build, together, and what the foundation of that future is. Then, we need to ensure that our chosen foundation is strong, level, and big enough to support the whole world one day. 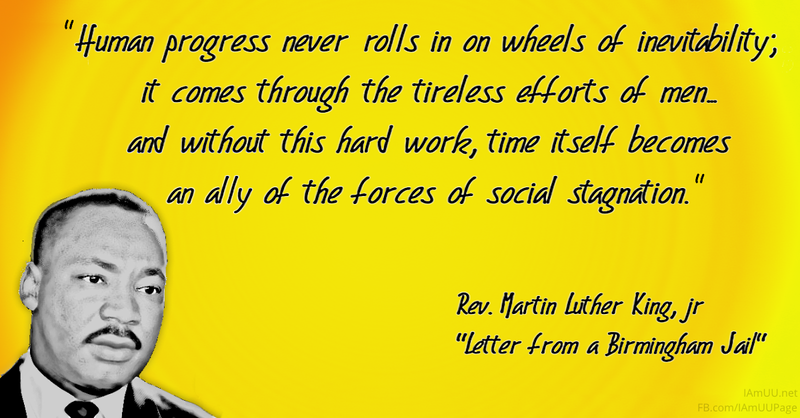 It will take work, but that work is the service and the quest for meaning that Unitarian Universalism calls us to do.